The Hamburger is one of the classics in our product range. A tasty product that fits well with the daily hot meal. Also great on a bun topped with vegetables and some sauce. 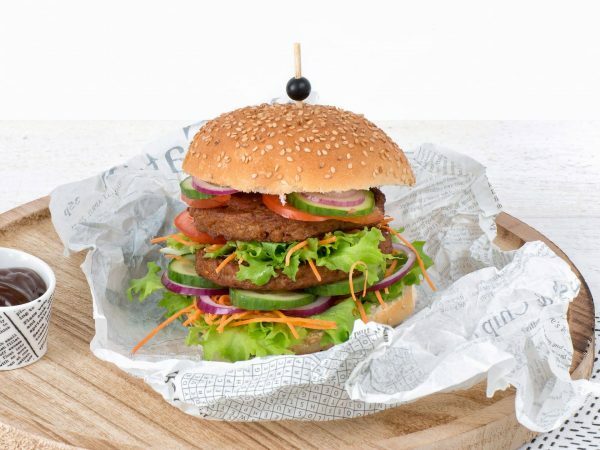 This vegetarian Hamburger is enriched with vitamins and minerals, making it a full-fledged meal component. A hamburger weighs 80 grams. Also available as a 100-gram product. Water, 19% vegetable protein (soy, wheat gluten), palm fat, starch (potato, wheat, corn), egg white*, tomato paste, natural flavouring, sunflower oil, garlic, salt, sugar, colour (plain caramel), spices, barley malt extract, mineral (ferrous fumarate), vitamin B12. * free-range eggs. Produced in a facility that processes peanuts and nuts. Reference intake of an average adult (8400 kJ/2000 kcal). Frying pan: 4-6 minutes on moderate heat. Turn every now and then. Oven: 8 minutes at 180°C. Turn once. Microwave: 1 minute on 900W. Barbecue or grill: Rub with (olive) oil. Grill on both sides for 2 minutes. More information about the possibilities? Get in touch with one of our commercial staff members via the form below. We like to discuss your ideas and we usually answer in a couple of hours.